Last year when I found out I would teach 3rd grade, I panicked. Joey was diagnosed in 3rd grade. I panicked that these 3rd graders would remind me of the time Joey lost. I panicked the pain would be too much to bear. I panicked what if a book they read, a song they sing or a joke they tell could be Joey’s favorite, then how am I going to hold back tears? My first year of teaching 3rd grade Mandarin immersion classes turned out to be an amazing year. I have the best students and parents I could ask for. Smart, inquisitive, passionate about Chinese language and culture, my little friends show me what it means to embrace other culture. Their parents remind me everyday the sacrifice a parent makes for their child’s education. Days at work go fast with lesson planning, switching two classes, grading, meetings…The tempo of the day is intense, with 2 classes, 42 students learning two languages with two curricula. Even with a full-time teaching assistant, I often find myself fail to finish what I planned. I could finally take a break and breath this week as summer is here. Wednesday when I said goodbye to kids, I just realized a year with these 3rd graders already passed. Not a single day goes by that I don’t think of Joey, yet I didn’t panic. I shock myself. How did I survive? 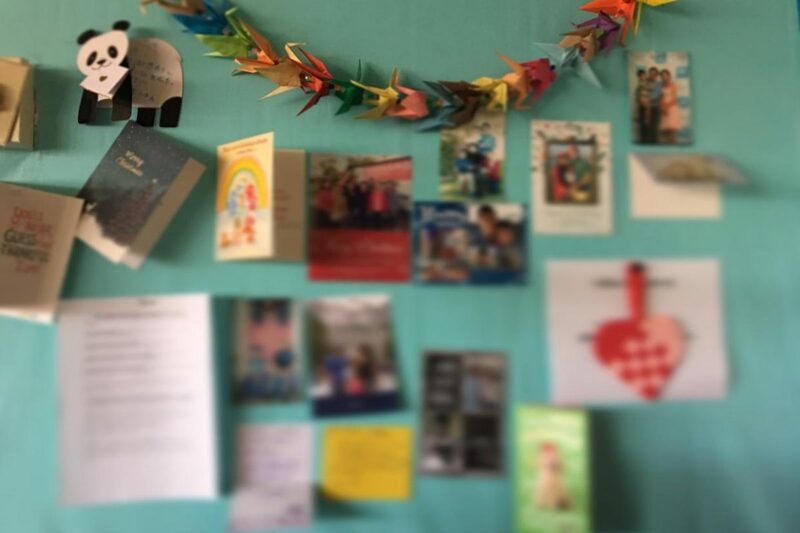 I looked up and saw the bulletin board by my desk – the one that I see every day: under a string of origami cranes, there are picture of Joey, pictures from students’ families, colleagues and notes from kids. I guess this is how I survived. This is how my empty heart is filled little by little -with my little friends’ love of learning, with the support from parents, and with the passion to share my heritage. I had poured my heart out to save my child, to miss him every minute and the heart became so empty that I had thought it never can be filled. Yes, it can be. I see the smile in the picture, Joey’s smile. He is with me all the time inside this classroom. He is cheering for me, to survive the days without him, to help children like him, and to instill the confidence in my students. There are probably days ahead at school the sorrow would overwhelm me, but I won’t panic. In this world of sin and sorrow there is always something to be thankful for. I’m thankful for my children and now my little friends. Since the only way to take sorrow out of death is to take love out of life, this journey of pain, loneliness and sorrow will come through.